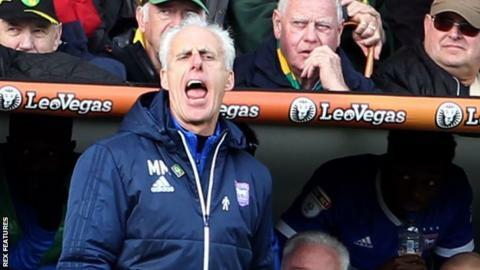 Ipswich Town manager Mick McCarthy has apologised for his language in the aftermath of their goal at East Anglian rivals Norwich City on Sunday. The 59-year-old was caught swearing by television cameras as he celebrated Luke Chambers' 89th-minute opener. But the Tractor Boys were denied a first win over Norwich since 2009 by Timm Klose's stoppage time header. "To be honest I forgot the cameras were there and can capture every word now," McCarthy told the club website. "You don't think about that during the game. For those who were offended by my language, I apologise." After the game, former Wolves, Sunderland and Republic of Ireland boss McCarthy denied his words were aimed towards Ipswich's travelling fans. "It was a big moment for us, coming so late in the game. You can get carried away in situations like that," he added. "I'd like to reiterate, though, that my comments were not aimed at anyone. It was just a reaction to the goal and what it meant at that time."